Now he has to pause sometimes and ask, “Which part of my identity am I playing out at the present moment?” He is a physician priest — and a priest physician. 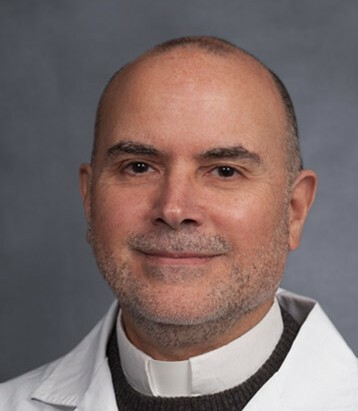 His work includes saying Mass on the weekends, helping with spiritual direction, practicing medicine, and teaching medical students. According to DeMarco, Ignatian spirituality makes it easy to combine practicing medicine, living the religious life in community, and serving as a priest — at least in theory. In practice it’s a lot more difficult. Dr. DeMarco will be one of the featured guests at the upcoming Practice & Presence gathering. Read more of his story here. Are you a Christian in healthcare who longs to experience your healing work as a calling? Do you believe that the church should matter for modern healthcare? Do you long to connect your work with your Christian commitments? Held at Duke Divinity School, Practice & Presence aims to help health care practitioners and spouses imagine and engage their vocations with clarity, faith, and joy. Click here to learn more.